The Sightless Among Miracles statue at the Jimmy Carter Presidential Library and Museum is a solemn reminder and monument of the wonderful humanitarian work former U.S. President and First Lady Jimmy and Roselynn Carter have engaged in most of their lives and continue to do even today. Although his global efforts are understated by many, President Carter has been one of the most involved world leaders, during his administration on Capitol Hill and since, in efforts to eradicate disease, poverty, and discrimination. The Carter Presidential Library and Museum chronicle many of the Carter's endeavors...much better than the media ever has. "For hundreds of years, a child leading a blind elder has been the fate of families stricken with river blindness (onchocerciasis) in Africa and Latin America. Now the demise of this ancient scourge is in sight, thanks to a drug donated by Merck and Company and distributed to millions of people by the Carter Center, the River Blindness Foundation, and others. 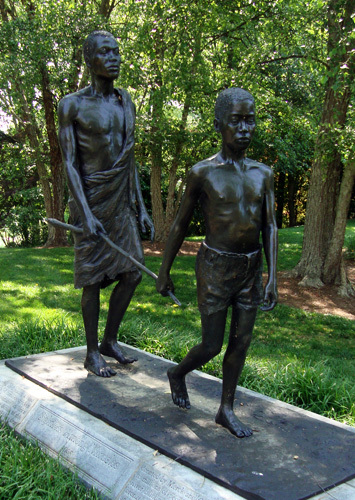 This bronze sculpture was created by R. T. Wallen and donated by John and Rebecca Moores."